This week on Rocco's Dinner Party, caterer Vanessa Cantave left the loft $20,000 richer after serving the best French cuisine for his guests. Today, we talked to her in an exclusive interview about her experience on the show and what she has coming up next. Q. Gina, RealityWanted: What was your cooking experience prior to Rocco's Dinner Party? A. Vanessa: I own and operate a catering company called Vanessa Cantave (formerly Yum Yum Chefs). Q. Gina, RealityWanted: What made you want to try out for the show? Were you a fan of Rocco's? A. Vanessa: A friend harassed me to death to audition. As a celeb, yes, I was a fan of Rocco. As a chef, I wasn't really that educated on his food. Q. Gina, RealityWanted: When you found out this week's theme was French cooking, what was your reaction? A. Vanessa: Relief and excitement! It's my favorite cuisine to prepare! Q. Gina, RealityWanted: Were you intimidated by the guests that Rocco had at the party? A. Vanessa: No, not at all. 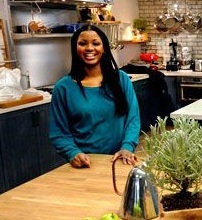 Q. Gina, RealityWanted: What did you think of Natalie as a chef and competitor? A. Vanessa: Natalie was a different kind of chef than me. Our training, education, and experience are so opposite. I wasn't sure what to expect from her, but I really focused on my dinner party throughout the experience. Q. Gina, RealityWanted: What dish do you feel put you over the top for the win? A. Vanessa: The braised shortribs. Q. Gina, RealityWanted: Does winning the $20,000 prize help you more personally or professionally? A. Vanessa: Both - I can have some fun and buy something frivolous, but also put a good amount back into my business. Win-win! Q. Gina, RealityWanted: What do you want to do next? Have you thought about more television? A. Vanessa: I'm opening a slider and french fry place in my neighborhood. I'm also starting to develop recipes for an entertaining-themed cookbook. I'm excited about some tv appearances I have lined up. I would love to have my own show one day, but definitely not in the reality world or cooking competition genre. I think one cooking competition is enough for me! Rocco's Dinner Party airs Wednesdays at 10/9c on Bravo. Follow Gina @ginascarpa and "Like" her on Facebook!